Vinegar is not only for cooking. I am sure you have heard of distilled vinegar being used in the kitchen for multiple purposes. I am going to explain a few of them now. If you have a nasty smelling drain combine 1 cup baking soda and one cup of hot distilled vinegar down your drain. Let this sit for 5 minutes or so, then run hot water down your drain. You can also use this technique for your garbage disposal. To clean your microwave mix 1/2 cup white distilled vinegar and 1/2 cup water in a microwave-safe bowl. Bring it to a rolling boil inside the microwave. Baked-on food will be loosened, and odors will disappear. Wipe clean. To clean copper pans combine 1 cup white distilled vinegar, 1 tbs of salt and enough all purpose flour to create a thick paste. Rub all over your copper pan let set for 20 minuets and rinse clean. 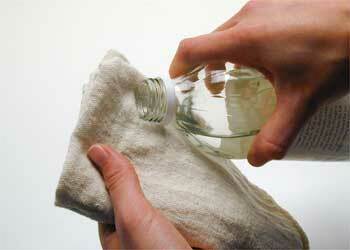 To clean glass combine equal parts of white distilled vinegar and water in a spray bottle. Spray on glass and use news paper to wipe clean. To disinfect, spray non diluted white distilled vinegar on cutting boards, counter tops, kitchen sink and any other surface you would like to disinfect. ← Tired Of That Grout Looking So Dingy? Vinegar is an acid and needs to be used with care. it can damage many surfaces including natural stone. balances. Thank you for your comment.